FILE - Afghanistan, security forces take position during a fighting outside a government compound in the city of Lashkar Gah, capital of Helmand province, Afghanistan, May. 13, 2015. Officials in Afghanistan said national security forces Sunday reestablished government control over a key district in the restive southern province of Helmand after days of bloody clashes with Taliban insurgents. The offensive to retake Musa Qala was backed by NATO-led airstrikes and it “killed or wounded more than 220” insurgent fighters, a Defense Ministry spokesman Dawlat Waziri told reporters. Waziri said government forces lost at least one soldier while several others were wounded. Local military officials, however, reported the national forces did not suffer any casualties. The Taliban has not yet commented on government reports. The Islamist insurgency had overrun the volatile district on Wednesday after fierce clashes that left up to 35 Afghan security personnel dead. 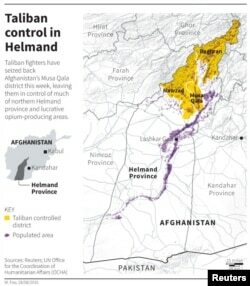 The insurgents still are in control of two other districts in Helmand, a known poppy-growing region in Afghanistan. Mostly British forces were based in the province during NATO’s decade-long combat mission in Afghanistan. Britain and the United States together lost hundreds of soldiers in their bid to keep Taliban insurgents from the province.